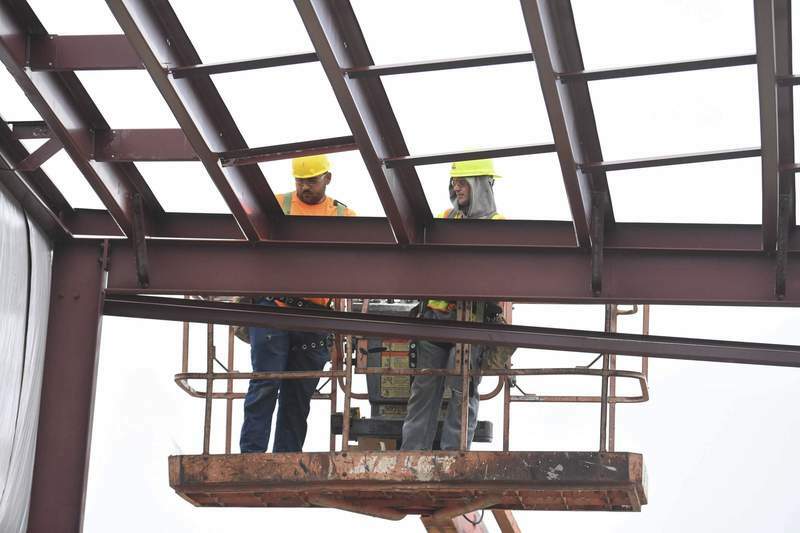 Michelle Davies | The Journal Gazette Dominick Clark, left, and Andy Longardnerattach clips to the beams for the roof installation of the new Junior Achievement building at Wallen and Coldwater roads. Mike Moore | The Journal Gazette Construction on the new Boys & Girls Club at 2609 Fairfield Ave. is expected to be complete by April. Mike Moore | The Journal Gazette To make room for about 42,000 square feet at the new Boys & Girls Club on Fairfield Avenue, adjacent homes had to be purchased and demolished. 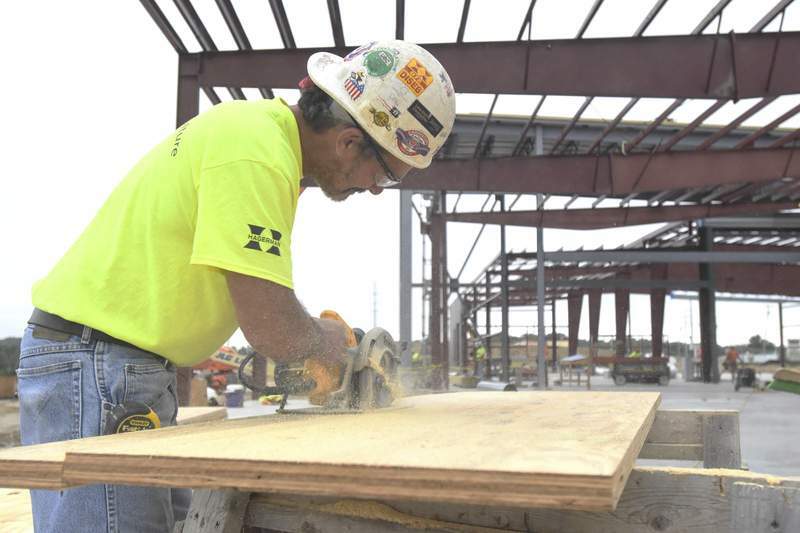 Michelle Davies | The Journal Gazette Dave Canady, journeyman carpenter with Hagerman Construction and Local 232, cuts plywood for a roof system at the JA construction site along Coldwater and Wallen Roads. 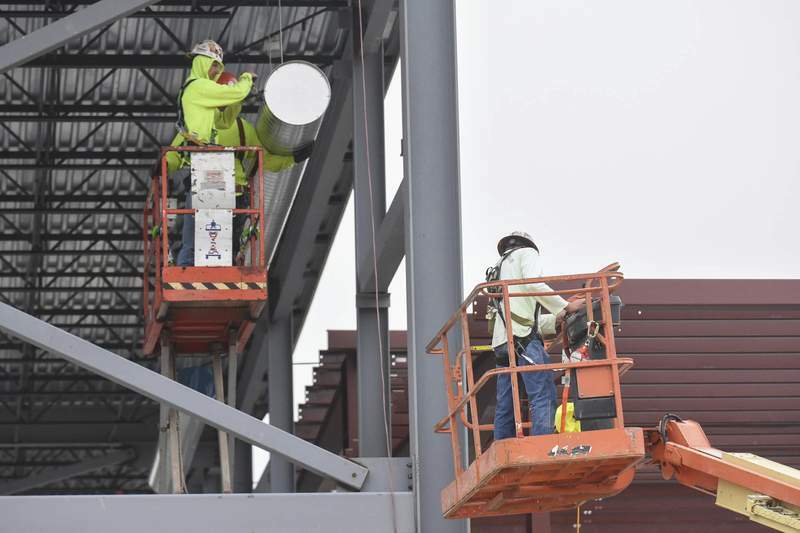 Michelle Davies | The Journal Gazette Crews install heating ducts at the Junior Achievement construction site. 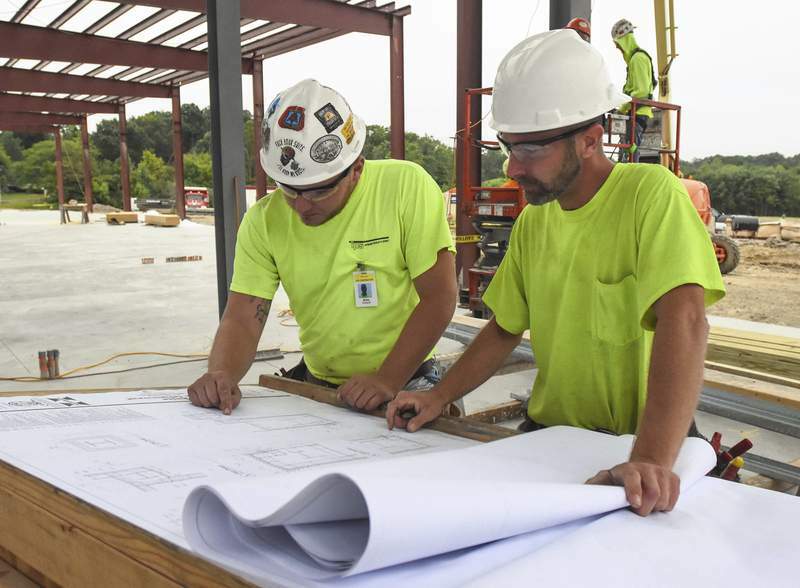 Michelle Davies | The Journal Gazette Blake Crouch, union carpenter, and Marc Pappenbrock, carpenter foreman, both with Rosema Construction, look at blueprints for the Junior Achievement construction site. The construction sites are about 8 miles apart, but the goal of both projects is similar – developing youth. Junior Achievement of Northern Indiana and the local Boys & Girls Club are pressing forward with multimillion dollar capital projects that will lead to larger buildings for the programs they offer. 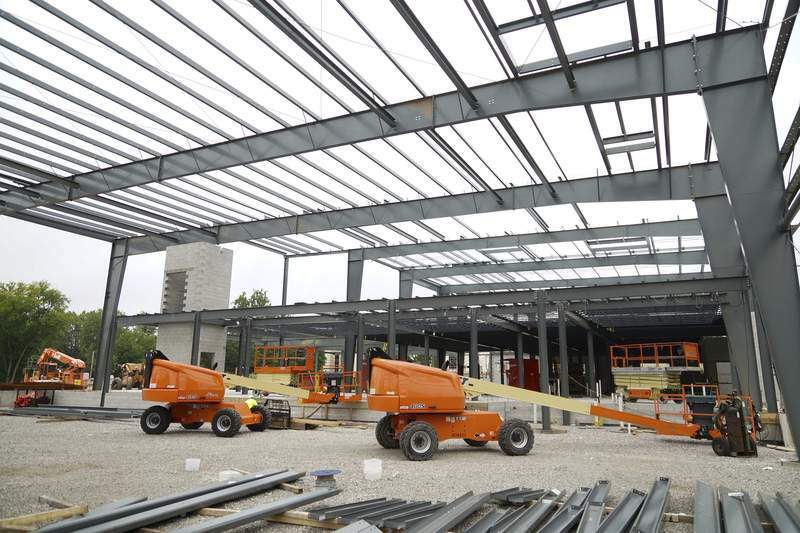 The structures for the facilities – one on the city's north side and one on the south side – are taking shape, essentially framing the future. JA programs focus on educating youth, with an emphasis on economic success, including through business ownership and understanding the global economy. The organization has a $12.5 million fundraising campaign for the new headquarters at Coldwater and Wallen roads on the city's north side. Currently, JA is headquartered at 601 Noble Drive, tucked away in a shopping center area north of Coliseum Boulevard. Jay A. Wilhelm, an executive with Hagerman, Inc., the construction contractor, said the new JA should be completed in July. That would be in time for the fall school semester. “It was an unusually wet spring and it did cause some delays,” Wilhelm said late last week. But the excavator for the project pushed through. The structural steel frame is complete, actually ahead of schedule Wilhelm said. Work is now being done to close the building in with roofing and wall systems by October, which would allow contractors to work on interior finishes during the winter. About 12 to 15 tradesmen are on the job site most days, Wilhelm said. 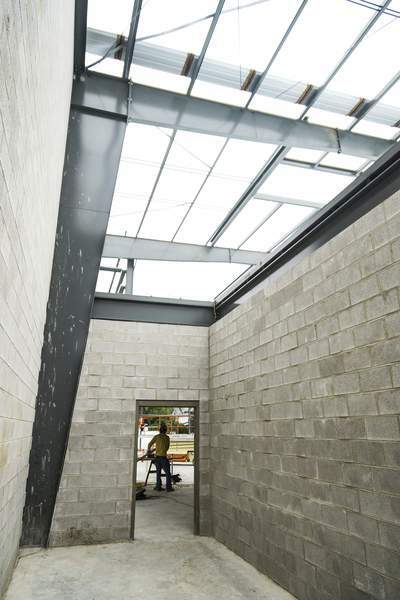 Contractors for the Boys & Girls Club are continuing construction for its new building, with an anticipated completion of April, according to an update last week. The agency's expansion on Fairfield Avenue near Pontiac Street required purchasing several adjacent homes and demolishing them to make room for about 42,000 square feet in a new facility. The Boys & Girls Club helps expose youth to career opportunities through various programs, including mentoring. The Boys & Girls Club, which served 2,800 youth last year, announced in January it had raised nearly $8.4 million in a campaign with an original $7.7 million goal. Junior Achievement's website says the organization, which serves 30 counties in northern Indiana, southwest Michigan, and Van Wert, Ohio, had more than 5,900 volunteers mentor nearly 131,000 pre-kindergarten through high school youth.